CRM Motori Marini was funded in 1950 by Germano Mariani, who right from the beginning decided to produce propelling systems for military crafts and luxury yachts. The company inherited the technological experience matured with the gasoline engine Asso 1000 - a well-known engine in the aeronautical sector - which has been the prototype of the marine propelling systems. 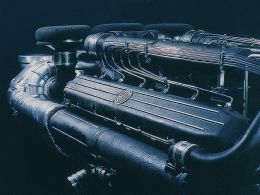 Approximately ten years later, the company started producing diesel thermal units for a new generation of engines with the same design and power as the earlier ones. Right from the start, the Italian firm concentrated its efforts on consumption reduction, on the use of turbocharged and intercooling and on optimization of the ratio weight/power. Today, CRM offers diesel engines ranging from 1,350 to 2,100 hp, with 12 or 18 cylinders in V or W arrangement considered to be the lightest of the category. CRM production is conceptually different from large-scale production and this renders the company's products performing and reliable. It was not by chance that the military sector gave CRM a substantial boost for research, with the intent of producing an engine that could support heavy duty without sudden or frequent speed variations. The special design of the Italian company's thermal unit offers minimal vibrations, in fact CRM engines may be used without flywheel. CRM propelling systems' balanced design allows limited stress to all moving elements and to their housings, thus requiring reduced maintenance and offering a long-lasting working life. CRM engines use an indirect injection system in pre-chamber capable of ensuring clean combustion and low temperature of the exhaust gas, so much so that the emissions are 30% lower than the limits imposed by IMO and 94/25 CE rules. Whoever buys a CRM engine knows that he can count on complete and customized assistance by the company, which with the help of specialized technicians or by supplying spare parts all over the world, is capable of satisfying the needs of each client before as well as after installation. AB Yachts is one of the many shipyards that install CRM engines on its crafts. For its AB 88 with water jet transmission the yard installed three 2,100hp CRM BR2 having 18-cylinders with W arrangement. For further information please contact: CRM Motori Marini; via Marnate 41; 21053 Castellanza (VARESE) Italy; tel. +39 0331 572600; fax +39 0331 505501; website www.crmmotori.biz; e-mail info@crmmotori.biz.